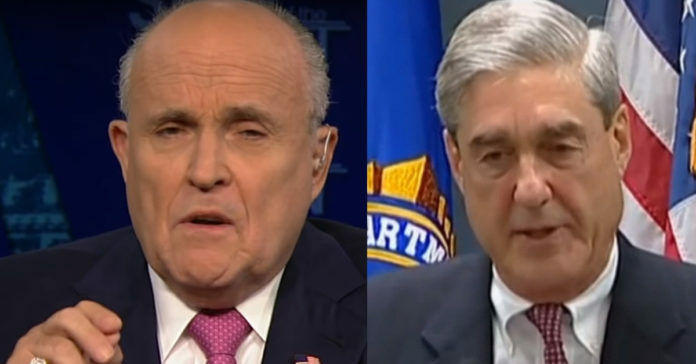 Former New York City Mayor Rudy Giuliani made a bombshell allegation against Bob Mueller today on Fox and Friends that if true is a total game changer. Look, we all know something went wrong during the 2016 election and we need answers because at risk is democracy itself. We need answers and Rudy wants them now: “All those texts of Strzok and Page deleted after they find out Strzok is texting that he hates Trump, that he’s going to get him, that he’s going to stop him, and if he can’t stop him, he has an insurance policy to get him out of office,” Giuliani said. “I believe Mueller is the insurance policy to get him out of office,” he said. “I’m not just saying that. Strzok was his first investigator. How is it that all the ones that are eliminated are the ones he did when he was working for Mueller?” Giuliani said of the texts that are missing and presumed deleted. “There are those of us who believe you don’t have anything on collusion. Do you have anything that shows the president was involved in a conspiracy to hack the DNC with Russia? Of course you don’t. But if you do, let the justice Department review it, put out a report. We’re ready to rebut it. I’ve had report ready for two months,” Giuliani said. “First he was coming out in March, and then in May. We’re in, now, the fourth-degree of separation from the non-crime collusion,” he said. 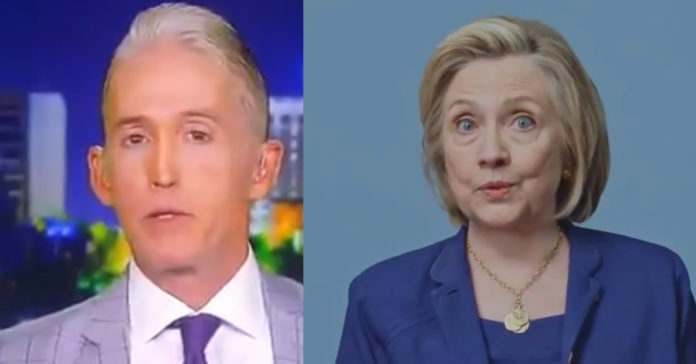 “We went to the non-crime obstruction to justice. That didn’t work out for him. Then he moved on to campaign contributions which, by the way, are not a violation of the campaign finance law. You can pay a judgment or a claim against you. That’s not a campaign expense,” Rudy said. “The Edwards case determined that. That’s another non-crime they’re investigating. And then they’re looking at now the Russia tower. Well, they should go to Moscow. There is no tower,” Giuliani said. “The whole thing is a phony,” he said. “Mueller should be investigated for destruction of evidence for allowing those text messages from Strzok to be erased, messages that would show the state of mind and tactics of his lead anti-Trump FBI agent at the start of his probe,” Rudy said. 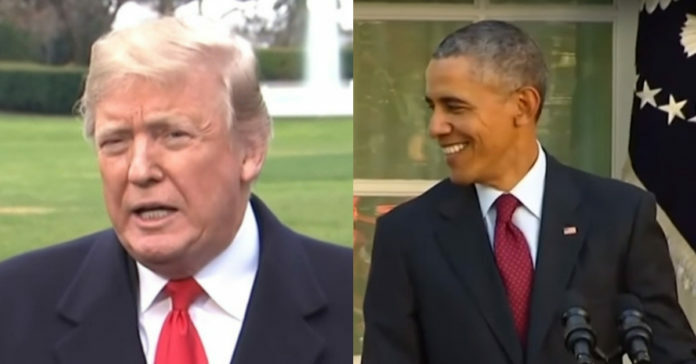 The Obama era is over and the Trump administration is doing its best to unravel this great country from a host of burdensome regulations and laws he imposed as if by fiat. But Trump can’t do it all alone, he needs some help now and again and Trump just got a massive assist from a federal appeals court. From The Daily Caller: A federal appeals court ruled Friday that an Obama-era labor law that made businesses responsible for labor violations committed by contractors was too broad, Reuters reports. The National Labor Relations Board (NLRB) ruled in 2015 that companies and franchisers with “indirect and direct control” of employees could be held liable for labor violations committed by contractors or franchisees. The D.C. 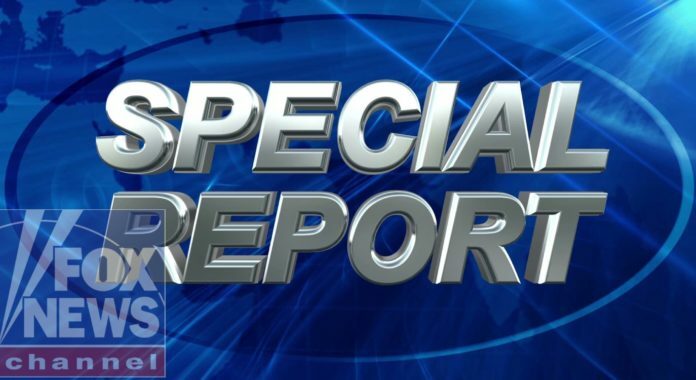 Circuit Court of Appeals ruled 2-1 that the board did not sufficiently define “indirect” control and sent the 2015 decision back to the board for a more restricted explanation. Franchisers, companies and pro-business groups have sought to have the ruling overturned. An attempt by President Donald Trump’s NLRB fell flat after Republican board member William Emanuel was forced to retroactively recuse himself from ruling in a case that would affect the 2015 decision. The Obama-era NLRB’s decision threatened to topple the current franchise business model as franchisers that tried to navigate or avoid the additional liability the law forced them to take on. Most franchisers began pulling back support for franchise businesses. Free enterprise is the engine that drives our economic train and while we need some regulations and rules, going too far often has the exact opposite effect and stifles innovation and freedom and that is not who we are. While Chuck Schumer and Nancy Pelosi are on vacation, President Trump is still in Washington D.C. working to end waste in government. 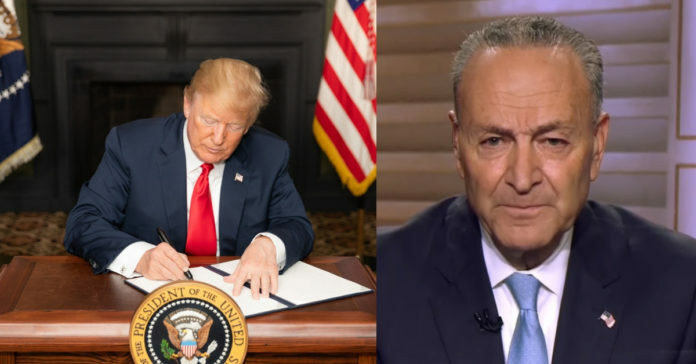 Trump took aim at a key constituency of the Democrats, the federal workforce, and stunned the hapless Schumer with a new executive order long been rumored that will freeze pay raises. From CNN: President Donald Trump issued an executive order Friday freezing federal workers’ pay for 2019, following through on a proposal he announced earlier in the year. Trump told lawmakers he planned to scrap the 2019 pay bump for federal workers in August, saying the federal budget couldn’t support it. In addition to the 2.1% pay increase, the executive order also cancels a yearly adjustment of paychecks based on the region of the country where workers are posted, called the “locality pay increase,” that was due to take effect in January. Jeff Flake is headed for oblivion, destined to be noted by history as being the worst of all political cowards. Look, if he really believes all the nasty things he says about Trump why has he done nothing but talk? A Senator has power, yet all Flake does is whine and complain. 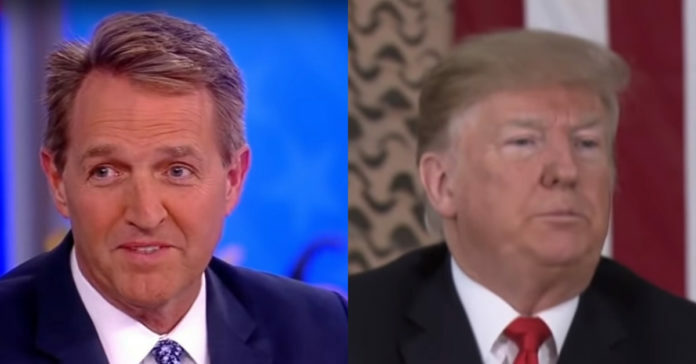 If Trump is this monster then Flake had a duty to actually do something not just whimper to MSNBC about Trump. So you know he is full of it and his attacks are for show and to promote the fading brand that is Jeff Flake, who is undoubtedly one of the most ridiculed men in Washington. He deserves the scorn from conservatives and he deserves it from the liberals too, and to prove how out of touch he is, it looks like his arrogance will win the day and he will mount a challenge to Trump in 2020. Talk about deluded. From The Daily Caller: “Let me ask you this. As you’re leaving Congress, as you’re leaving Washington, you’ve said a Republican needs to challenge Donald Trump in 2020. Is that going to be you on the Republican side, Senator?” CNN’s Jim Acosta asked. “There are others that seem more willing than I am. I’ve been doing this for 18 years now. It’s – it’s nice to look forward to a little break. But somebody does need to challenge the President,” Flake stated. “Will you think about it, do you think? Will you consider it?” Acosta followed up. The Arizona Senator opted to retire instead of running for reelection last November. Back in August, when asked if he thought he could win a Republican primary for his seat, he said, “Not a chance today. That won’t always be the case, but it is today. This is the president’s party much to my consternation and I think the long-term detriment to the party. I hope that’s not always the case. Nancy Pelosi jetted off to Hawaii during the government shutdown and in doing so exposed her strategy to deal with the new government shutdown. Enter Lindsey Graham who explained her route is folly that will lead to disaster for the incoming Democrats. 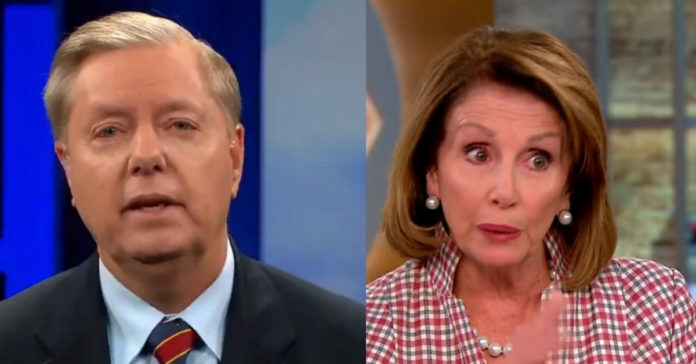 From The Daily Caller: Republican Sen. Lindsey Graham told House Minority Leader Nancy Pelosi and her Democratic caucus on Friday that there would not be a deal on a funding bill unless it included appropriations to construct a wall on the U.S.-Mexico border. Pelosi has reportedly walked away from further shutdown negotiations and pledged not to appropriate a single dollar toward funding a wall. The California congresswoman promised to put forth a funding bill that does not include any of Trump’s demands when she assumes the speakership in January. Graham has been a vocal advocate for building a wall. In early December he urged Trump not to concede funding, but rather stand strong and require at least $5 billion in appropriations. The battle over the wall will move to the new Congress and Pelosi has a choice to make – compromise with Trump (Trump has reportedly offered to take $2.5 billion instead of $5.7 for the wall) or go all in on a shutdown over $1 billion and some change. If she won’t compromise that means she has sold out the entire country in order to try to score cheap political points – Trump has already come down from his ask and Pelosi needs to come to the table and make a deal. CNN and others in the media led what seemed like a coordinated attack on the wife of Supreme Court Justice Clarence Thomas yesterday. 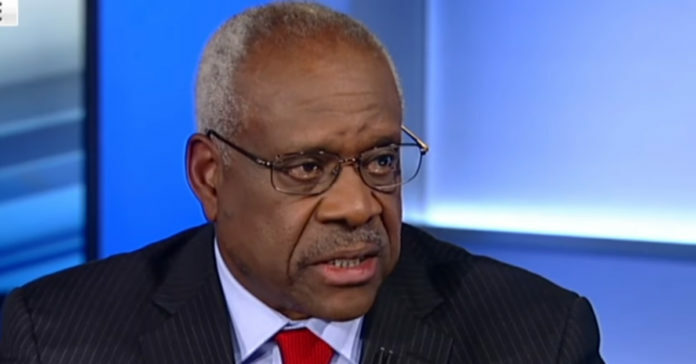 It is not surprising they would go after Ginni Thomas, after all, we saw what the left and their friends in the media did to Brett Kavanaugh so nothing is beneath them. From Newsbusters: On Friday’s The Lead on CNN, fill-in host Dana Bash led a discussion of whether Ginni Thomas — the wife of conservative U.S Supreme Court Justice Clarence Thomas — is expressing too many “far-right” political views on venues like Facebook. It’s not just a divided Congress about to come back to Washington, a more polarized Supreme Court is also just days away from a new session. And the far-right, Trump-supporting Facebook posts of one of the wives of a Supreme Court justice is raising questions. But it’s her recent rapid-succession of Facebook posts blasting Democrats and promoting highly partisan views that are prompting pushback, Earlier this month, Thomas put up this meme, asking “Where is the wall?” portraying California as a war zone where undocumented immigrants attack and carjack Americans. Schneider then fretted over a meme that raised the possibility of voter fraud in four unspecified congressional seats — probably in California — as the CNN reporter complained that Ginni Thomas provided “no proof at all” in the post. Don’t believe Nancy Pelosi when she says she is not thinking of impeaching Trump, she will. The Democrats will surely cave to their base and abandon common sense and move to impeach Trump. They will also harass Trump and his administration with an endless string of subpoena’s and will launch investigations into every aspect of the Trump administration. 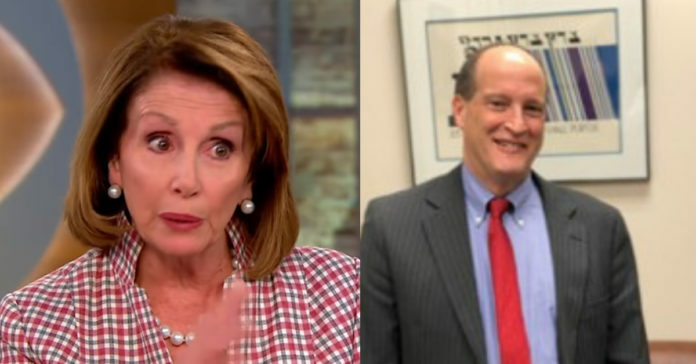 That won’t stop Pelosi from leading the Dems over the cliff and if you needed any proof that Pelosi is gearing up for war, look at who she just hired as her lawyer. From The Washington Examiner: Speaker-designate Nancy Pelosi, D-Calif., has picked a new guiding force for Democrats investigating and potentially impeaching President Trump when they take control of the House next year. Douglas Letter, a 40-year veteran of the Justice Department and former associate counsel in President Bill Clinton’s White House, will be appointed to the role of House general counsel, Pelosi said in a statement. Lette, 65, served as director of the Justice Department’s Civil Division appellate staff up until February — a departure that was facilitated, sources told NPR, because of Trump’s constant criticisms of the DOJ. Letter’s long career for the DOJ included roles such as deputy associate attorney general under former Attorney General Janet Reno, and senior counselor to former Attorney General Eric Holder. His decades of service, which included working on cases such as Obergefell v. Hodges, the 2015 landmark case which legalized gay marriage, was praised by the likes of Holder and Benjamin Wittes, editor-in-chief of Lawfare and friend to ex-FBI Director James Comey. In his new role, Letter will provide legal advice to lawmakers and their staff, regardless of political affiliation, according to the Office of General Counsel website. That means Letter is poised to be at the heart of any debate over impeaching the president. Democrats poised to take control of committees in January have said they are ready to begin a bevy of investigations into the president and a number of members have called for Trump’s impeachment. In the run-up to the November midterm elections, Pelosi indicated that wasn’t poised to seek impeachment if her party won power. But she didn’t dismiss the prospect either. Mr. Letter served as the Director of the Civil Division Appellate Staff at the U.S. Department of Justice between 2012 and 2018, and he recently retired from that office after 40 years there. As Director, he supervised approximately 60 attorneys representing the interests of the United States in the U.S. Supreme Court, federal courts of appeals around the country, and various state Supreme Courts. Mr. Letter is now a Senior Litigator at the Institute for Constitutional Advocacy and Protection at the Georgetown University Law Center, where he is also a Visitor Professor. Mr. Letter earned a Bachelor of Arts degree in American History from Columbia University in 1975, and a Juris Doctor degree from the University of California (Berkeley), in 1978. He joined the Department of Justice under the Attorney General’s Honors Program in 1978, and entered the Senior Executive Service in 1992. Mr. Letter has been a member of the District of Columbia Bar since 1978. In 1994-95, Mr. Letter served in the White House as an Associate Counsel to President Clinton. In 1999, he served as a Deputy Associate Attorney General under Attorney General Janet Reno. And, from 2012-13, Mr. Letter was Attorney General Eric Holder’s Senior Counselor. At the Department of Justice, Mr. Letter represented the Federal Government in courts around the United States in numerous significant cases, and presented oral argument for the United States in the Supreme Court and in all of the federal courts of appeals, as well as in various district courts. His primary areas of expertise included constitutional separation of powers and Presidential authority issues, national security and foreign affairs litigation, extradition matters, constitutional takings issues, First Amendment speech claims, Freedom of Information Act cases, ethical rules for Justice Department attorneys, administrative law, False Claims Act enforcement, criminal and civil enforcement of the consumer protection laws, and tort actions brought against federal officials. A frequent guest reporter on Fox news and a rising star in the conservative movement died suddenly at 26. Bre Payton wrote for many conservative publications and frequently appeared on Fox News and on the One America News Network. Payton, who was based in Washington, was in California this week guest-hosting a show on the One America News Network. On Wednesday, Payton told her Twitter followers to tune in that night to see her on television. “She immediately called 911 and Bre was taken to the hospital where she was admitted to the ICU, sedated & intubated, and doctors began working up a diagnosis,” the post said. “I cannot believe this. @Bre_payton was such a beautiful light, smart and funny and kind and talented,” Fox News anchor Shannon Bream tweeted. 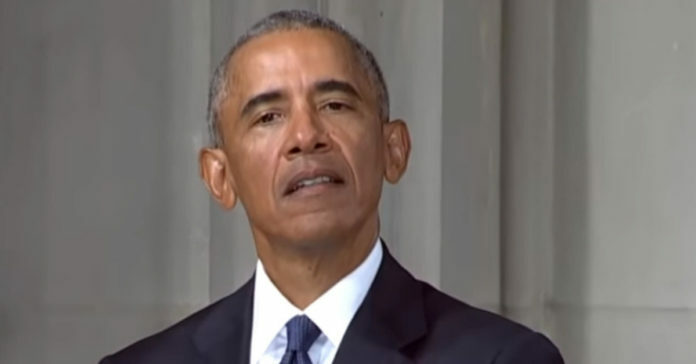 Barack Obama’s ambassador to Syria just released a devastating op-ed that removes all doubt about what an abject failure Obama’s Syrian policy was for the world. Look, Trump always said he inherited a mess and we are really just now learning the full extent of it. Thankfully, we elected the right man at the right time in history to right the ship. From The Washington Examiner: The former U.S. ambassador to Syria has said President Trump was “essentially correct” in removing troops from the country. Robert Ford, a career diplomat and fluent Arabic speaker served as U.S. ambassador to Algeria under President George W. Bush after being a senior diplomat in Iraq. He was then appointed U.S. ambassador to Syria by President Barack Obama in 2010. “The president should view the hullabaloo that erupted after he announced the Syrian pullout as an opportunity to take a number of steps to make the most of his essentially correct, but widely unpopular, move,” Ford wrote in an op-ed Thursday for the Washington Post. Ford is the most recent U.S. ambassador to Syria. He was recalled in late 2011 due to threats to his safety following the Syrian uprising, which he supported because Bashar Assad’s regime began using force against protesters. He retired in 2014 and became a fierce critic of Obama’s Syria policy. Ford argued in hius article that it would be virtually impossible for U.S. troops to defeat the Islamic State’s ideology and suggested that it was up to Syria to fix its own problems. From The Daily Caller: Ford pointed out that many opponents fear the pullout will lend a victory to Russia, Iran and Syria, but the former ambassador called this fear “absurd,” noting that Syrian President Bashar al-Assad’s regime already controls roughly two-thirds of Syria. The regions that the U.S.-backed Syrian Democratic Forces (SDF) control are largely deserts and drought-prone oil fields with low-value crude.